All the pups have gone to homes! 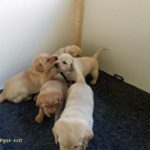 Family oriented breeder of gun dog Labrador Retrievers with fantastic yellow lab puppies. All of our pups have been sold and gone to their new homes. Three pups sold, pickup on 16 November! Five weeks old! Snow and grass! Ten days old! Over double in sized and very energetic! Had new litter 21 September!